The main feature of the new DONIC Alligator Combi blade is the difference in speed between the forehand and backhand playing sides.The AR /Def blade is made of a 5-ply combination which has been carefully crafted to create perfect harmony between the different playing characteristics of each side. 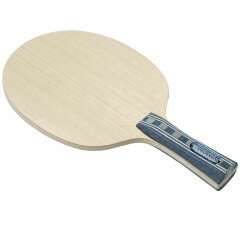 The core is made of soft Balsa wood which makes the blade very light and relatively stiff. On the forehand side, two harder and faster veneers are used, whereas for the backhand side somewhat softer and therefore slower veneers are used. The result is that outstanding power can be achieved when playing topspin shots with the forehand side and fantastic control is guaranteed when playing a defensive game away from the table with the backhand side. The DONIC Alligator Combi is unique in that it complements both defensive play away from the table and attacking strokes and blocks close to the table. Players who use disturbing rubber sheets such as Anti and long pimple rubbers will be especially amazed by the enhanced playing possibilities of this blade. Donic Blade Alligator Combi is beeing added to cart.